The secret to really good shortbread? A cool oven; it gives a light golden, crumbly biscuit. 1. Preheat the oven to 150°C, gas mark 2. Put the flour, icing sugar and butter into a bowl and work together with your hands until smooth. 2. Lightly flour a work surface and roll out the dough to 0.5cm thick. The dough will be very crumbly, so you might find it easier to roll between 2 large sheets of greaseproof paper. Using a 5cm biscuit cutter, cut 28 rounds, then cut a 1cm circle in the centre of half the biscuits. Carefully transfer to a baking tray lined with baking parchment. Bake for about 25 minutes until barely golden at the edges. Transfer to a wire rack to cool. 3. To ice, mix the sugar with a drop of food colouring and a few drops of cold water so it's soft enough to drizzle. Place the biscuits with the holes on a wire rack over a baking tray, so the excess icing can drip away. 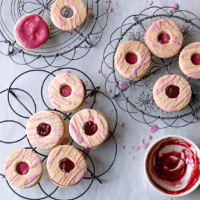 Using a spoon, drizzle the icing over the biscuits in thin lines. 4. For the filling, beat the icing sugar, half the raspberry jam and the clotted cream until thick. Spread over the remaining biscuits, adding a ¼ tsp of jam to the centre of the filling. To finish, top each with an iced biscuit. This recipe was first published in Thu Feb 16 14:48:00 GMT 2012.